Charlotte Bennett is visiting the village in the Cotswolds where designer Alexandra Rankin Hunt and her fiancé, Ian Mabry, live (Christmas at Carriage Hill, 2014). The occasion is the destination wedding of Charlotte’s cousin Samantha Bennett and Justin Sloan of the Knight’s Bridge, Massachusetts Sloans (Cider Brook, 2014). Charlotte, a marine archaeologist, is dealing with the lingering effects of a serious case of decompression illness that she suffered while rescuing a fellow diver and coming to terms with the fact that the illness means she can no longer dive. Because she and Samantha are as close as sisters, Charlotte agreed to be Samantha’s maid of honor, but they are both aware that the wedding will be Charlotte’s first since she left her groom waiting at the altar on their wedding day. The combined stresses leave Charlotte in need of a relaxing drink at Ian Mabry’s pub where she has joined other wedding guests for a meet-and-greet on the eve of the wedding. Greg Rawlings, a friend of Brody Hancock and a colleague in the Diplomatic Security Service, stopped in London to visit with Brody and his wife, the former Heather Sloan, (Echo Lake, 2015) and found himself added to the wedding guests. Greg is exhausted from an intense job, his first since he was critically wounded when an assignment went awry. A recent divorce, amicable though it was, has had an emotional impact, particularly concerning his awareness of his limited role in the lives of his two children, Andrew, fifteen, and Megan, 13, who live in Minnesota with their mother. Charlotte and Greg meet at the pub where they are both guests and share a drink and some banter. They also share a dance at the wedding. A spark is struck. Greg is intrigued, but Charlotte is wary. However, Greg knows something that Charlotte does not. They have both been asked to housesit for the honeymooners. 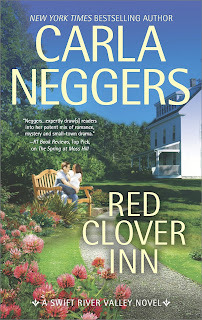 The “house” is the Red Clover Inn, located in Knight’s Bridge, which Samantha and Justin are in the process of restoring. Charlotte is on leave from her job while she considers what changes new physical restrictions will mean for her career. Greg has a few weeks before he is to report to his new job at his agency’s headquarters in Washington, D. C. Greg was planning to make his excuses since he could not imagine himself contentedly spending two weeks in quiet Knight’s Bridge, but once he learns Charlotte will be there, he invites his kids to join him in New England. Charlotte, who is anticipating two weeks of peace at the unoccupied inn, is not pleased to find Greg will be sharing her space, but as the two of them spend more time together, the attraction between them strengthens. They are warmed by the genuine welcome extended to them by the residents of Knight’s Bridge. When Andrew and Megan join them, the foursome enjoys the lowkey lifestyle and one another’s company. The kids even engage in a bit of matchmaking. Charlotte and Greg find time to consider the changes in their lives and the fact that they are gradually falling in love. But is this new love worth risking their bruised hearts? 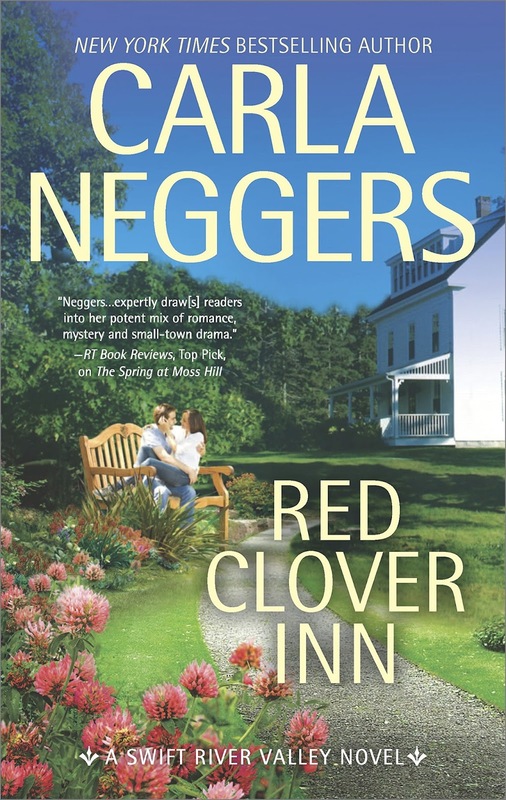 Red Clover Inn is the seventh book in Carla Neggers’s Swift River Valley series. It is different from the other books in that portions are set in England, Scotland, and Washington, D.C. as well as in Knight’s Bridge, but many of the characters, including Greg Rawlings, will be familiar to readers who have read earlier books in the series. The Knight’s Bridge connection and the sense of home the small town offers continue to be central. Like the leads in other Swift River Valley books, Charlotte and Greg are likable, interesting characters for whom it is easy to root. I especially appreciated the appeal of Andrew and Megan and their relationship with their father. I have frequently said that if I like a book’s characters, I can forgive other flaws. I have also often expressed a fondness for quiet books. In fact, my sister sometimes accuses me of liking books where “nothing happens.” This book taught me that I need to be more cautious making such generalizations. Despite my affection for these characters, I grew restless because the book is so free of conflict. The life-altering experiences of Charlotte and Greg take place before the story opens, and while both need a period of introspection, there is no doubt that they will accept the changes and get on with their lives. There are also no real obstacles to their romance other than Charlotte’s wariness, which any romance reader knows will be overcome. The mystery involving Grandmother Sloan’s time capsule seems tangential, and the resolution is anticlimactic. The honeymoon scenes in Scotland are sweet and will doubtless be popular with fans of Samantha and Justin, but they add little to the story. This is not a bad book, but it is a disappointing one when measured against the richness of the first three books in the series. Fans devoted to the series will doubtless enjoy the wedding and the gathering of many popular characters as well as a return visit to delightful Knight’s Bridge, but the book’s appeal to new readers is limited. You are probably right. People who tend to read series, get caught up in the continuation of the story and it's characters.